What is involved in a Discovery Flight? A Discovery Flight is an hour and a half lesson which allows the student to get a feel for flying, see if he or she enjoys it, and whether or not the school is a good fit. This initial lesson includes 40 minutes in the air (the majority of that time the student will be piloting the plane) and 50 minutes of valuable ground instruction. During the ground instruction, the instructor will go over the lesson plan for the flight and the student will learn the parts of the aircraft, how they work, and safety features for the flight. They will also learn how to pre-flight the aircraft. The student will learn to go through the checklist to start the engine and will be able to taxi to the runway. The instructor will do the take-off and at about 500 feet in the air, the student will gain the controls. The student will then climb up to about 3,000 feet and at that altitude will learn positive flight control operations, turns, climbs, descents, and straight and level flight. When it is time to head back to the airport, the instructor will do the landing and taxi back to our hangar. At the end of the flight the student will use the checklist to shut the aircraft down. After the flight the student will receive a log book with their flight time recorded and this time never expires. The time flown can go towards a private pilot certificate if you choose to continue lessons. Are the instructors at Dream Flight School FAA certified? Can I switch instructors during my flight training? You can switch instructors at any time. We understand that different personalities mesh better than others or that sometimes a different instructor is necessary to meet your scheduling needs. It is recommended that you try different instructors during the beginning of your training, and then stick with the instructor of your preference throughout the remainder of your training. Flying is safer than driving a car. In the rare occurrence of an in-flight emergency, a small aircraft can glide without power for several miles to find a suitable landing place. How old are the airplanes? All of our aircraft are year 2000 or newer, with modern avionics. This is very new as far as airplanes go. All our modern aircraft are fuel injected and have certified color moving map GPS units installed. How much will it cost to obtain a private pilot's certificate? It's estimated that it will take between $10,000-$14,000 to obtain a private pilot's certificate. This depends on how often one is able to take lessons and if able to take advantage of our wonderful block rate discounts or package deal. We offer flight training financing through Pilot Finance, inc. Stop by the school for more information or to pick up an application. Do you offer block rate discounts? We do offer a block rate discount with up to 7% off our standard aircraft rental rate. This is a great way to save money if you know up front you will be completing your private pilot training or if you know you will be using a certain amount of hours on the aircraft. 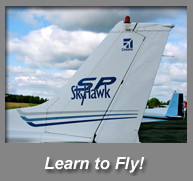 By purchasing a $3,000.00 block, you receive a 5% discount on instruction and flight time. How long will it take to earn my private pilot's certificate? The FAA requires 40 hours of flight time for the private pilot's certificate, but the national average is between 60-80 hours. This depends greatly on the frequency in which you take lessons and fly. Flying more often allows you to retain more knowledge between flights. You can earn your certificate in as little as 3 weeks or over the duration of a full year, depending on your schedule and preferences. Most students take 6-8 months when training part time with a full time job. You can be any age to fly with one of our certified instructors, but you must be at least 16 years of age to fly solo and 17 years of age to obtain your private pilot's certificate. Many students choose to start lessons before they turn 16 and celebrate their 16th birthday by soloing for the first time! I'd like to purchase a Discovery Flight or flight lessons as a gift - how can I do that? 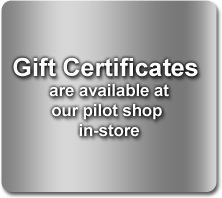 We have gift certificates available for Discovery Flights and lessons - stop by the school anytime to pick one up. If it is more convenient, give us a call and we can receive payment by credit card over the phone and mail a gift certificate to you. These make great unique gifts for anyone interested in adventure or flying! I don't want to fly, but I'd like to take a photo flight tour of the area - is this an option? We offer aerial local area sight seeing and photo tours at our standard aircraft rental and instructor rates. The tour can be as long as you'd like and offers the best view of the region. Our Cessna 172 aircraft is a high wing aircraft that provides excellent visibility. The windows can also be opened during flight for spectacular "bird's-eye view" photo opportunities. Our Diamond is a four seat, low winded aircraft with stick controls and a G1000. This aircraft has panoramic visibility out of its large canopy. Great for sight seeing and photo tours. How do I get to Dream Flight School? Dream Flight School is conveniently located at the Carroll County Regional Airport. Once you arrive at the end of Airport Drive, make a left turn and follow the sign to Dream Flight School. We are located in Hanger #5.